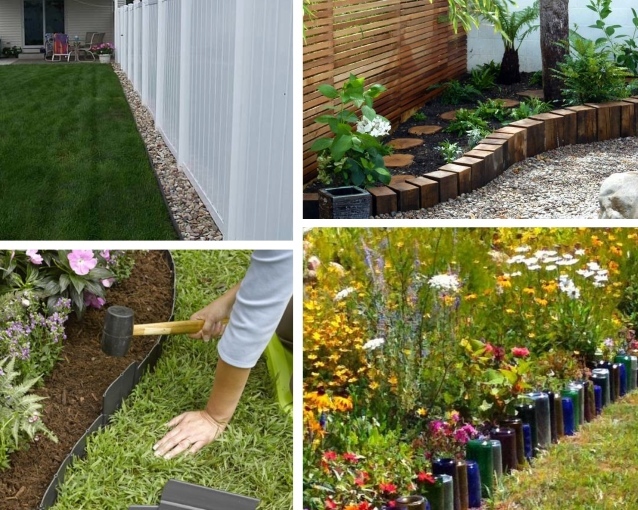 If you’re on this page, you’re probably looking to enhance your landscape borders while adding to the style of your garden. If so, there are a range of different materials and textures to choose from. Whether you are seeking to add a classical touch to a traditional garden, or you are seeking to add color and interest to a modern-styled home, there are many inexpensive landscape border ideas for you to choose from. Hey! 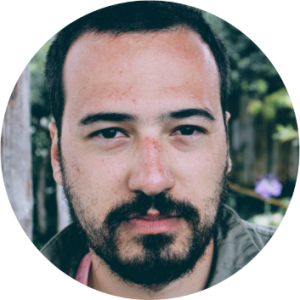 Looking for high-resolution photos of perfect landscape border designs? Click here or scroll down to the bottom of this article! Add a new layer of style to your house with decorative edging. Use a range of different materials to separate your lawn from plant-filled borders. Create an attractive and textured feature bed in a small space. Add colour to a modern garden using glass beads. Create a concrete and pebbled pathway in a small country garden. Whatever your choice of materials, there are cheap and effective ways to add style to your garden. Let’s explore a choice range of different materials in more detail. A combination of wrought iron and brick adds a classical touch to your border garden. In this image, you can see how steel has been used to create attractive, ornate borders which add to a formal style garden. The curved wrought iron shapes contrast with the square bricked borders and trimmed hedges in order to soften this look. This style of border suits classical styled gardens, and the ornate style of the steel framework would combine well with other wrought iron elements such as archways or benches in order to carry through the theme. It’s also a great decorative element for a romantic style garden. Stone adds an organic element to your borders. You can select from a range of sizes and types including pebbles, stones, rocks or boulders. 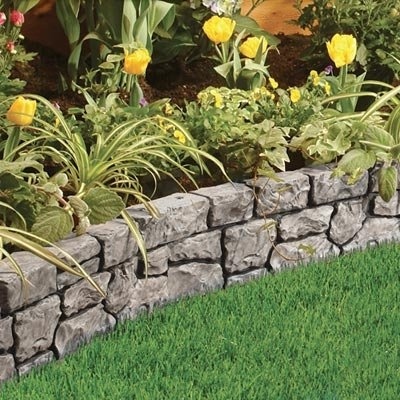 In the above image, you can see how a selection of small, angular stones have been packed together to create an attractive small border which shapes around a corner bed. Using a large number of stones or pebbles which contrast to the surrounding areas will assist you to create a feature garden. Stones, rocks and boulders can be used to create flow, as they can be easily used to create organic or curved flower beds. However, they can also be used to add texture to a modern garden. Stones, rocks and boulders be used to add texture to a modern garden. If you wish to add interest, different colored pebbles can be used to create a dramatic effect. Wood offers a warm feel to any garden. You can add a sleek, curved and organic feel to your garden as shown in the below image where curved wooden panels have been used to provide a sleek and modern touch to a garden. Alternatively, as in the next image, a chunky, sleeper style design adds a rustic element to a garden border. Sleepers are thick and raw in appearance and often come in different heights. Their usage offers height to small flower beds. Sleepers are textured in appearance and will assist you to create an attractive feature border which is both cheap and effective. If you have a slope in your garden that’s difficult to work with, or a small corner you would like to turn into a feature area, a terraced border garden will add huge appeal. In this image, a small area has been staggered so that it has different heights. In the image, sleepers have been used to create a warm and interesting rustic bed. However, you can use a range of different materials such as rocks, boulders, bricks or concrete to create attractive border walls. If you wish, you could also add decorative elements such as rocks or pebbles to your terraced borders. Although border edging often creates a divide between your lawn and flower beds, you can use a stone pathway running through a small cottage sized garden to create interesting flower bed borders. This is particularly effective in a casual style garden such as a beach house, or a country styled garden. In the above image, a concrete and pebble pathway has been created as a divide between two different flower beds. Soft ground covers surround the pathway. This simple yet attractive pathway makes a cheap but striking attraction. If you have a modern house with a playful feel, you might be interested in creating a glass border. The image below shows how glass has been used to add both color and texture to a creative modern garden. Both the blue color and the smooth texture add contrast to the surrounding area. These colourful beads have been scattered inside a gravel border to add color, interest and lightness to the modern style garden. If you’re looking for a cheap, effective and durable choice, plastic borders may be for you. Plastic borders come in a range of different designs, and will help you to create a neat barrier between your lawn and flower beds. Many plastic borders are also raised, offering you the opportunity to keep your pets from running into your flower beds. In this image, a plastic trellis has been used as edging to create an attractive country style border. White trellis contrasts strongly with the surrounding greenery, creating a feature area. However, as with all trellises, it is possible to grow creepers over the area, creating a living wall to border your flower beds. Plants make excellent borders to divide the areas of your garden. In the image above, structured plants have been used to soften the garden and create a clear divide. However, it is also possible to use soft plants such as ground covers which drizzle over concrete paving or wooden fences. Ground covers will not only add an attractive feature area to your garden, but they can be aromatic as well. Use ground covers to keep your soil moist in dry climates. As you see, there are a wide variety of different border edging ideas that can be used to add texture, interest and style to your garden. By layering the different materials available throughout your garden, you will be able to emphasize your style. Border edging will also enable you to create feature areas in your garden. Explore your style, budget and garden plans before selecting the best choice for your garden. Remember to draw on all the inspiration you can find in order to assist you. This will really help you to save time by giving you the ability to explore a range of different photographs, plans and styles. This package will help you narrow down your choices while widening your options. You’ll also be given step by step assistance on how to plan your garden. It’s a resource I’ve used for years and I thoroughly recommend it. For more information on how you can gain access, go here! Alternatively, you can read my full review of the program. Thanks for checking out these ideas. If you have any questions, feedback or comments, drop them in the comments! Feel free to share the article if you liked it using the buttons below. Love these ideas, thanks. We want to get some nice edging going in our front yard without breaking the bank; evidently there are a lot of options. I like most of these, although I think the glass pebbles look a bit tacky. A textured stone border looks the best to me. I’m going to have to figure out where we can get the stone we need. Any ideas or recommendations? Thanks for the comment. I actually agree in that glass-style borders wouldn’t be my first choice. As for stones, you can get them at most home improvement stores (big box Home Depot, Lowe’s, or smaller stores), and many greenhouses and garden centers carry a selection as well. What kind of stones in particular are you looking for? There are all kinds of shapes and thicknesses you can go for (for more ideas, you can check out the resource I linked to at the bottom of the article). Once you know what look you want, you can set out to find the materials you need. Good luck, and let me know if you have any other questions. the design in that second stone borders image looks fantastic. I think plastic border fencing might work well for me as well. thanks for this! Indeed, it’s one of my favourite styles also, although any of these ideas can work out beautifully if done right. Glad you liked this.